Was it weeks ago? Months ago? Years? When you don’t update your site regularly, you risk security issues, damage to your search engine rankings, and bad feedback from customers. The best sites post fresh content regularly, never miss a security update, and are compatible across all mobile devices. Even if you don’t plan on posting to your blog regularly, it’s still imperative to stay on top of essential security and usability updates. Want more detail on why website updates should never be ignored? No matter what platform you’re using to run your website, it will be vulnerable to security risks. Content management systems like WordPress rely on code, and hackers are always developing new methods to penetrate defenses and take control of websites. If you’re not prepared, you could lose all the content on your site, let customer details fall into the hands of malicious hackers, or have your website covered with spam and malware. 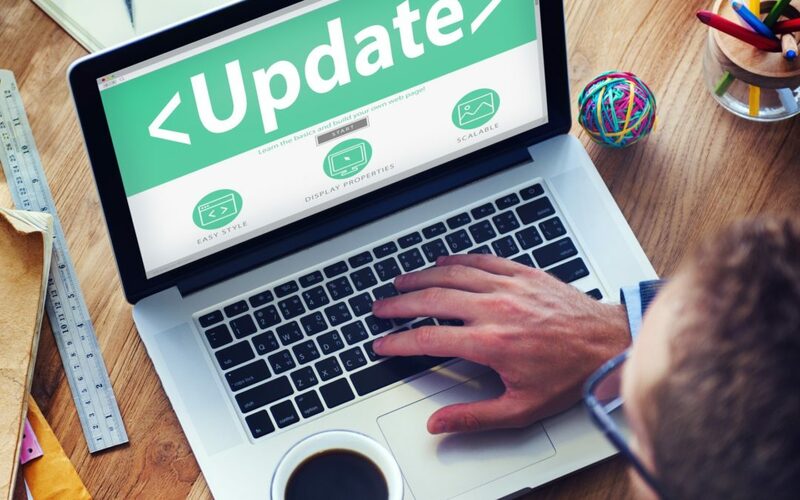 Updating systems like WordPress is usually as simple as clicking an ‘Update’ button and waiting a few seconds for the update to complete – so there’s no excuse not to. You should always test the functionality of your site after completing updates to ensure that there aren’t any bugs or issues. If you do notice problems, it’s easy to revert to a previous version of your site. Keep your website safe and secure by never missing an update. Have you ever visited a company blog and found that the last post was several years ago? This gives an awful impression and might lead customers to doubt that you’re even still in business. Even if you don’t have much time to dedicate to posting new content to your blog, it’s good practice to make a post at least once a month. This keeps your website looking fresh and gives customers a reason to keep visiting. Creating a content calendar is a smart way to ensure that you never miss a post, and it’s an excellent way to keep your content versatile and exciting. Sit down and brainstorm 10 – 20 different titles for blog posts, and then add them to a Google calendar. Insert notes, links, and ideas that will help when you come to write the post. If multiple members of the team will be working on blog posts, make it a shared calendar that everyone can contribute to. Did you know that only 30% of small businesses have mobile-friendly websites? That’s right – and failing to update frequently could mean that your site is much less mobile-friendly than you thought. A site which was optimized for mobile five or ten years ago will look very different to a website that’s optimized for mobile today. Even if you’re using a responsive theme that automatically adjusts your site for mobile users, you’ll need to remember to keep it updated. Most developers are vigilant about keeping themes current, but it’s important to do your own checks. Schedule a regular check into your calendar and try using the primary functions of your website on desktop, mobile, and tablets. If you notice any issues, get in touch with the developer to request fixes. If you have your own web designer, ask if they can make checks on an ongoing basis. With so many searches taking place on mobile nowadays, having a website which isn’t 100% mobile-ready is a disaster – so stay on top of it. Not keeping your site updated can negatively affect your search engine rankings in two key ways. Firstly, if lack of updates is making your site difficult to navigate, Google will notice and start giving priority to similar sites which are easier to use. Secondly, search engines prefer sites which regularly add new content and update existing content. This shows that you’re providing the most recent information to searchers, rather than giving dated advice. So, to give your site the best chance of ranking well, you’ll need to complete essential usability updates and post regular content to your blog. Once you’ve got a good back catalog of articles, you can start updating older articles with new information. This is a great way to boost your ranking without having to come up with a whole new post idea. Having an up-to-date list of keywords to target is also smart – a keyword which worked really well a few years ago might not be so suitable now. Use keyword research tools to find the terms with the highest search volume and lowest competition. Being one of the first to target a new term could definitely pay off. Is anything more frustrating than calling a company and finding that their number has changed? Or sending an email and then realizing that it’s gone undelivered? It sounds simple, but it’s really important to make sure that your contact information is up-to-date at all times. As well as basic details, like address and phone number, you should check that links to social media profiles are correct. You should also ensure that the contact details on your website match with any online directory entries you have set up. This prevents confusion and stops customers from getting you mixed up with your competitors. Google My Business is one of the most popular directories. If you haven’t done so already, it’s a good idea to read more about setting up a Google My Business page. It can be hard to keep your website updated when you feel like you’ve got a million other things to do. Stay on top of updates by assigning them to a specific member of your team, creating a recurring reminder in your calendar, and making your update checklist to follow. You’ll soon see the benefits of regular website updates – from increased security to higher search rankings. Want more tips on making your website work for you? Visit our blog today.